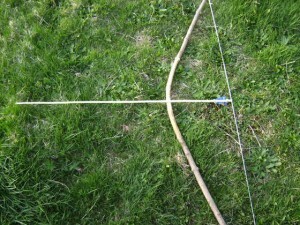 In this article, you will learn how to make a simple bow and arrow! (Adult help and supervision is required.) You will need to have access to trees with some various sized limbs and string. You will also need an adult to use a pocket knife. Choose a tree limb that is approximately 2 feet long and at least 1 inch in diameter. Ask a parent to use a pocket knife to cut the limb from the tree. Have an adult cut a V-shaped notch in each end of the limb. Then, lay the string over one notch, and wrap the string around the limb numerous times and tie it securely to the limb. Pull the other end of the string to the opposite end of the limb, which creates a bow in the limb. Then you must center the string in the notch and wrap it around the end of the limb numerous times and tie it off. This completes the bow. Take some smaller straight tree limbs and have an adult cut them so that they are approximately 1 foot long. Have an adult shave one end to a point and a notch at the other end; this creates your arrows. Place the notch of the small tree limb into the string of the bow, pull back, and shoot! Do not aim at people, animals or anything that may be hurt by the arrow. Keep a wide range around anything that may be hurt by an arrow and always have adult supervision when playing with the bow and arrow. Remember – safety is always the key thing to think about! You have created a bow and arrow. Enjoy! I love archery, I have a fully fledged bow at home! No weight for the tip of the arrows? so thats how you make them, do you know how to make a crossbow to?